Syrian rebels have launched a fierce offensive against President Bashar al-Assad's troops in four northern provinces, aiming to reverse a string of defeats, an NGO and rebels said Monday. UN chief Ban Ki-moon, meanwhile, said humanitarian access to Syrians remains "extremely challenging" a month after the world body demanded a lifting of sieges and bombardments of residential areas. The rebel offensive follows several victories for the regime along the Lebanese border -- in the Qalamun region, north of Damascus, and around renowned Crusader castle Krak des Chevaliers, west of the central city of Homs. On Monday, the rebels and their jihadist ally Al-Nusra Front seized a key area on the border with Turkey, gaining full control of the Kasab frontier crossing, the Syrian Observatory for Human Rights said. The takeover came even as the air force bombarded rebel positions in Kasab, in Latakia province, the heartland of Assad's Alawite sect, a day after Turkey shot down a Syrian warplane in the area. "It is clear that the opposition factions launched a fierce offensive in northern Syria after the battle for Qalamun," said Observatory director Rami Abdel Rahman. The assault has focused on Latakia, Idlib and Aleppo provinces, as well as in the north and west of Hama province. "The rebel fighters have advanced in all these areas, while the regime has clearly retreated," Abdel Rahman told AFP. In Idlib province in the northwest, rebels have taken over 15 army checkpoints in recent days. In Aleppo, the rebels have advanced inside the city and in parts of the neighbouring countryside. In the Hama province town of Morek, which lies on a key supply route linking the centre of Syria to Aleppo, rebels have fought off repeated attempts by the army to break through their lines, the Observatory said. 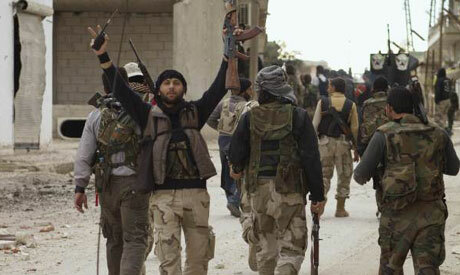 In Latakia province, opposition fighters launched a surprise offensive on Friday. Rebels say the advances are connected. "After the battle for the coast (Latakia) began, the army withdrew many of its fighters from Idlib to go fight there," said Colonel Afif al-Suleimani, an officer who defected from the army and now heads Idlib's rebel Military Council. "This opened a gap here in Idlib and we took advantage of it, and went on the offensive," he told AFP by Skype. According to rebel spokesman Ibrahim al-Idelbi, a key factor behind rebel factions taking the initiative was the withdrawal around two weeks ago of the jihadist Islamic State of Iraq and the Levant (ISIL) from most of northern Syria. A broad coalition of moderate and Islamist rebels has been fighting ISIL since January 3. Thousands of fighters on the two sides have been killed. ISIL and Syria's rebels were once allied in the fight against Assad, but mounting allegations of serious abuses by the jihadists turned the rest of the opposition against them. "ISIL's exit from the area is a key factor in the advances. Now, rather than having two enemies, the rebels have one (Assad's regime)," Idelbi told AFP. The developments come a day after Turkey shot down a Syrian warplane that Ankara said had breached its airspace. Damascus described the downing as a "flagrant act of aggression". Omar al-Jeblawi, an activist in Latakia, said: "The regime is very angry. They are using all their force -- army and paramilitary -- to try to stop the rebels, who in turn are trying to advance towards the sea." Kasab's majority Armenian Christian residents have fled the village because of the violence, the Observatory's Abdel Rahman said. After three years of war, Syria's government now controls only eight of the 19 official land border crossings with its neighbours Lebanon, Jordan, Iraq and Turkey. In New York, the UN chief called on both the Syrian government and opposition to take measures to ease the delivery of relief supplies to 9.3 million Syrians in need. "One month after the passing of Security Council resolution 2139, humanitarian access in Syria remains extremely challenging," he said. The resolution passed unanimously on February 22 called for the lifting of sieges and an end to bombardments of residential areas with barrel bombs. But it provides no sanctions against those who fail to respect it.